I love beans! They are such a hearty, filling, feel-good kind of food! They are just as wonderful in a thick hot yummy soup on a cold winter night as they are in a dainty cold salad on a hot summer day. Their versatility makes them a staple in my Cuisinicity kitchen! Nutritionally, they are a great source of low-calorie lean plant-based protein, rich in fiber, minerals and antioxidants. They are just so good for our health that I love every excuse to incorporate them in my cooking any way I can! Thankfully, there is such a large variety of them to choose from, that they make my “job” so much fun! I do, as a result, add more of these delicious and nutritious bean recipes to my repertoire all the time, so keep checking for more of them throughout the year! Even I can’t believe how much spinach I manage to throw into this yummy spinach marinara sauce with beans! Click on the photo for a little video clip! Another really quick and easy dish to throw together is my Black Bean, Tomato Corn Salad with Feta. It is a tasty salad that is very filling-perfect for lunch! My Moroccan Lentil Chickpea soup combines lentils and chickpeas to make it a complete meal in a pot with lots of protein and fiber–so yummy and nutritious! Why do I love my Moroccan Lentil Chickpea soup so much? Click on this photo, I’ll tell ya! Farro White Bean Risotto: Farro is a whole grain that has long been used in Meditarreanean cooking. Its nutty richness blends beautifully with the white beans and wine in this simple risotto. Simply Chickpeas I love an excuse to use chickpeas! In this simple recipe, I just bake them in a high temperature oven with a little olive oil and spices and they make for a great appetizer or snack. 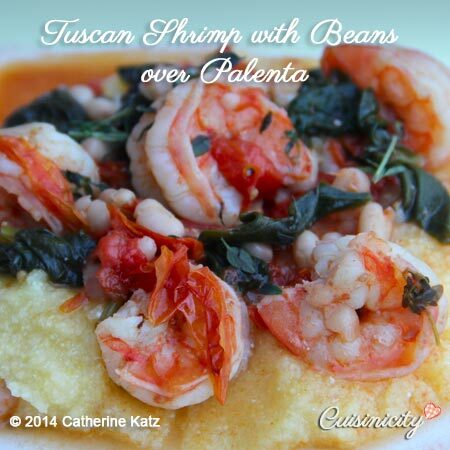 Ah, how I love my Tuscan Shrimp with Beans over Polenta! This is a simple down-to-earth dish with a rich Tuscan flavor. The white wine, fresh tomatoes and cannellini beans are just delightful with shrimp and fresh spinach, served over polenta: Que c’est bon! You’ll find a little cooking class video of it in my own kitchen here! Mediterranean Couscous Salad: This is a wonderful Mediterranean whole wheat couscous salad filled with chickpeas, artichoke hearts, bell peppers, tomatoes, fresh basil and topped with roasted sunflower seeds! It is perfect on a hot summer day, both because it is so refreshingly delicious but also because it requires no cooking at all! The couscous is raw and just absorbs all the wonderful flavors of the citrus dressing so that it is perfectly fluffy and not clumpy. This vegan salad makes for a complete dinner! 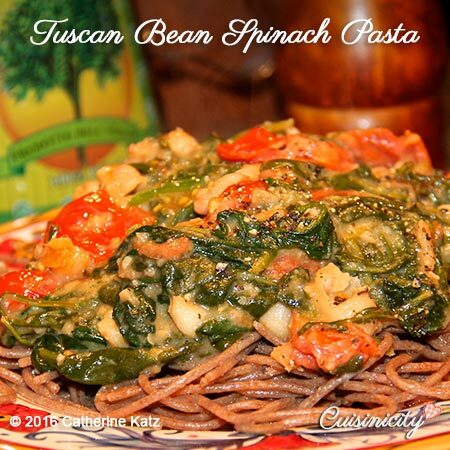 My Tuscan Bean Spinach Pasta: This is a throw-everything-in-the-pot kind of dish that you make 15 minutes before you sit down to dinner! It is filled with spinach and whatever other greens you would like (I love baby arugula in particular) and the beans blend in perfectly with the white wine to create an almost creamy sauce (just take a look at the photo, amazing, right?!). My Hearty Turkey chili is filled with beans and uses a relatively small amount of extra lean ground turkey breast. The addition of cornmeal at the very end makes it thick and creamy and gives it a nice Southwestern touch. It is perfect on a cold wintry night –just what the doctor ordered! I make a wonderful Vegetarian Chili (vegan, depending on what kind of beer you use) as well- YUM! 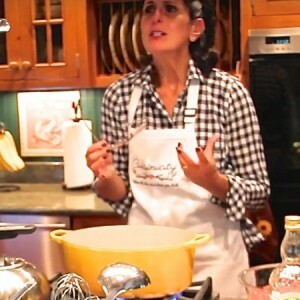 You’ll find a little cooking class video about it in my own kitchen here! 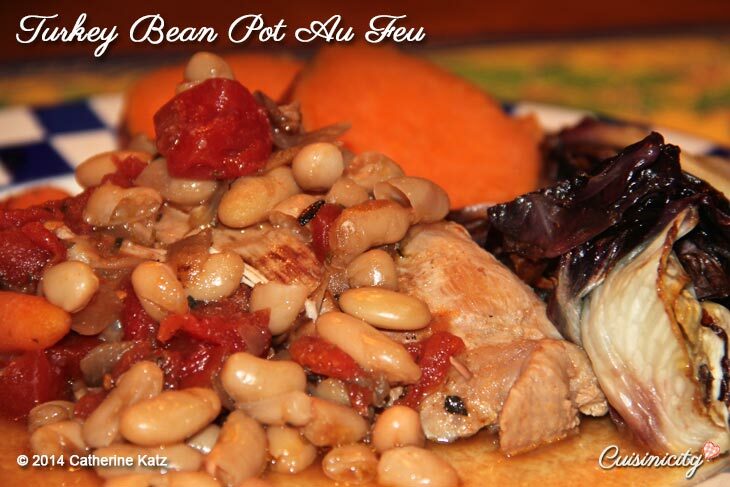 Turkey Bean Pot au Feu A pot au feu is one of those feel-good comfort stews that simmers slowly in the oven or in a slow-cooker for a long time and fills the whole house with wonderful smells. This one has a Provençal flavor with garlic, red wine, tomatoes, cannellini beans and of course herbes de Provence. 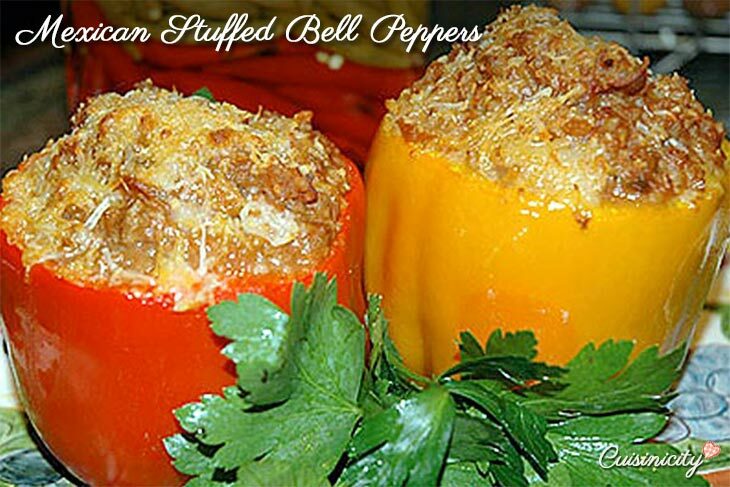 Mexican-stuffed Bell Peppers: I sneak in fat-free refried beans, bulgur wheat and lean ground turkey in this delicious recipe– It’s a complete meal stuffed in a pepper! 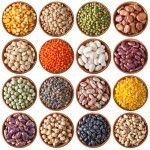 OK, That’s it for now and I promise I will post more as I create them on my “Beans” glossary page which you will find in my permanent Whole Food links on the left side bar of Cuisinicity—go ahead and take a look! This way, you will find beans WHEREVER I sneak them into my recipes and use every excuse to include them in your diet! 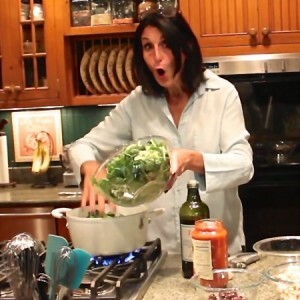 Delightful and amazing recipes Catherine Katz; love your muffins too, I also have my health muffins ,banana loafs and many healthy meal recipes, will try some of your bean meals very healthy, great intake of proteins. Thanks. Hi Catherine! Thank you for the inspiration! A friend gave me an electric pressure cooker recently and I found local, organic, heirloom beans and I’ve been cooking them from scratch vs. the canned beans. I never thought it would make such a difference in taste but it does! No pre-soaking and the beans take about 40 minutes start to finish. I still keep canned beans on hand but the dried beans are delicious and economical as well! Thank you for all you do to spread the knowledge about healthy, delicious cooking and eating. I’m not a huge fan of kitchen gadgets, having bought way too many that are not useful and just take up space in the kitchen. I will say the pressure cooker-mine is a Power Cooker-gets a lot of use. I cook batches of beans, and then use them in soups and chili, or add it to brown rice or quinoa salad, or sauté with onions and garlic and mexican spices and blend for refried beans in mexican dishes. With my cooker I set the cook time to about 20-25 minutes (some beans take less, some more) and it takes about 15 minutes to build pressure and cook. If the beans are not cooked enough I just turn it back on for 3-5 minutes or so. I know what you mean Peggy, and this only makes it that much more meaningful! I am definitely looking into it for myself! Glad for the reminder… Just going to soak some lentils to make a Turkish soup tomorrow. I actually never liked beans until I was introduced to your wonderful recipes. 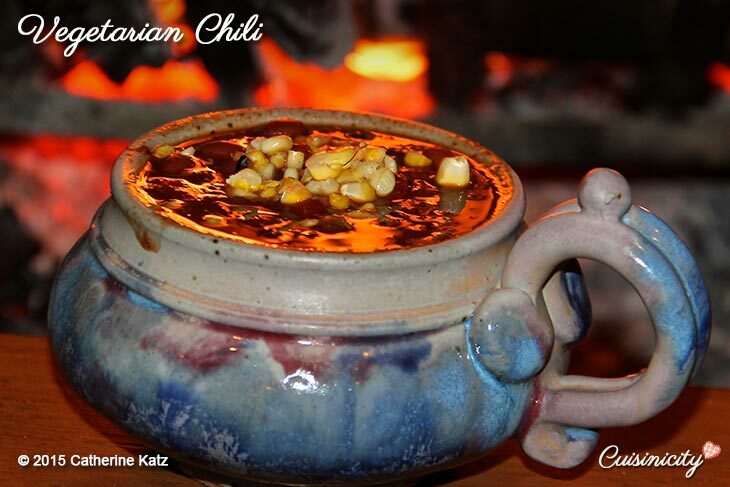 Your chili is to die for – so hearty – so delicious and so great for fall and winter weather. It reminds me I need to make one of your amazing dishes soon. I may start with the marinara sauce!!! You make “healthy” so much fun! Aw Thank you my Susan!!! As soon as our nights get colder, I promise I’ll make that chili for you!! Yay, Rhonda, thank you! Love that you do!! !